French beans or green beans are a favorite of mine, I love them in my soups, stews and curries. This time though,I wanted to try out a new way of making them. I stumbled upon a South Indian recipe that was so easy and sounded just delicious! So, for a quick supper last week with rotis, I made some Green Beans with coconut. Here is the recipe verbatim from the blog "Denufood". I didn't add the onions, but the rest was the same, and it was delicious! 3. Add the chopped beans and saute for couple of minutes. 5. Garnish with coconut and the serve as side or with chapati. We make it the same way too, just add a bit of jaggery / sugar to give it a sweetish twist. kem che Trupti? 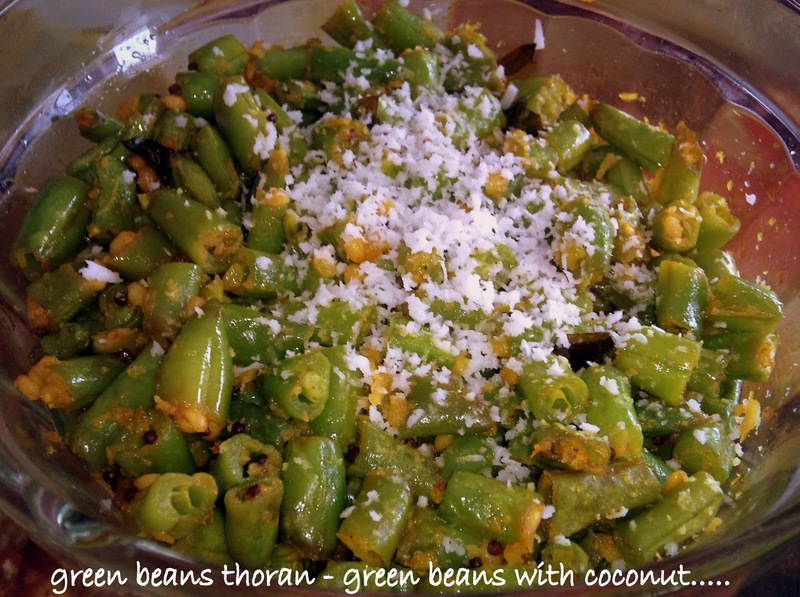 i too make a similar version & add some carrots too:) btw, if you like beans, you can try this shaak that i tasted recently, fansi vatana combination, gujju style adu/marcha sathey, try karje, bau saras shaak bansey :) tk care!